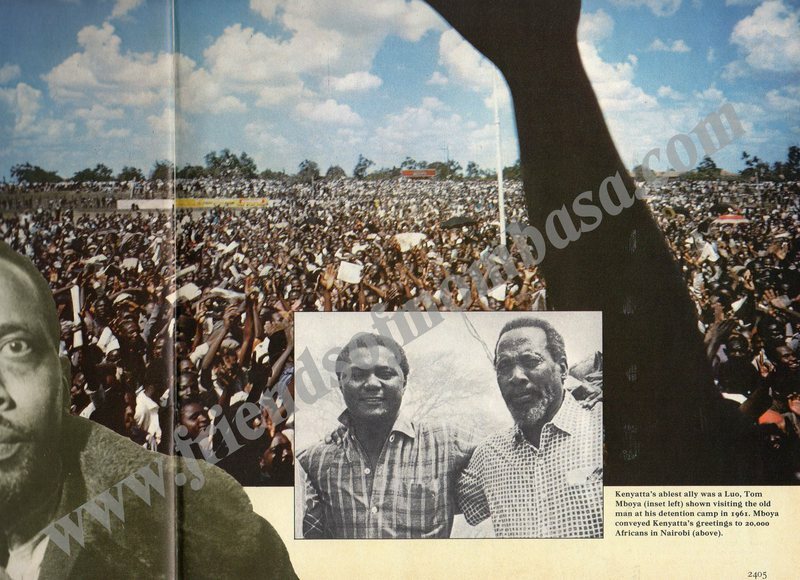 A time line overview of big and small events in the history of Kenya. If one really needs to establish what the Indian community were all about in terms of East African history, well it goes well beyond East Africa, in fact history of the Indians is only concentrated in the East African Region seen as a core/hub for trading and thus for obvious reasons, due to major trading factors along the Eastern Coast of Africa. Indians and Arab history recorded in that region dates back many centuries, the initial levy system was introduced by the Portuguese much later on and also by the British in the 1900's, which was hated by the Arabs and Indians alike. Indians had a hand in everything along the East African Coast, trading in their own Currency, Financial/banking system was operated by the Indians, transport, trades carried out over the waters as far as India and beyond, Distribution, Wholesale, Retailing, Farming, Transport Inlands, etc. Indians and Arabs who built up century’s worth of historic trade in the region were systematically targeted and stripped off as time went by, by the colonial government. The Indians were great traders in many aspects and business, in 1910 Sir John Kirk remarked on the work of Indian Traders in Nairobi: In fact drive away the Indians and you may as well shut up the Protectorate. It is only by means of the Indian Trader that articles of European use can be obtained at moderate prices. Winston Churchill in “My African Journey”: It is by Indian labour that the one vital railway on which everything else depends was constructed. In most European’s minds the Indians simply did not matter. 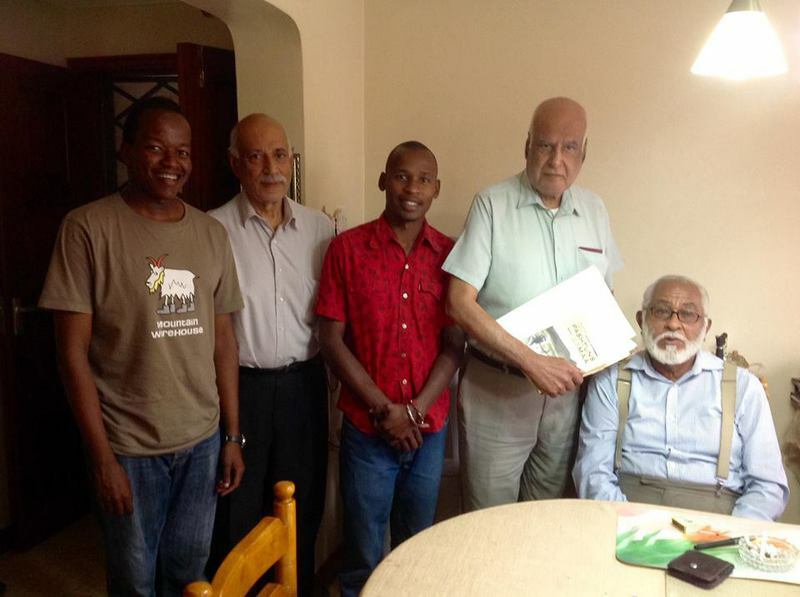 When writing of East African history in general, the role of Indians is ignored or slighted. It is the British that get the credit for ‘pluck and determination’ building the Railways even when it is admitted that Indians suffered untold horrors. Most if not all prime geographical areas were also chosen for themselves (Europeans) and area controlled by the British Europeans for the Europeans. The lack of information about Indians is due not only to the non-Indians’ disinterest (and often hostility). It is due also to the Indians’ own lack of Interest in writing about themselves. The question is, we had the British Colony at that time in India and were happy to oblige with the building of East Africa in terms of labour, therefore why is it that most of the Indian people who came over who had farming experiences were never given any sort of land to farm in East Africa but the British government opted for South African Caucasians to be brought over with a premise on allocation of prime free land? Mombasa was visited by the unknown Greek who wrote the Vtriplus in the first century A.D., who refers to it under the name of Tonike. Arab colonisation of the East Coast is believed to have begun about the eighth century. The Portuguese first appeared on the coast when Vasco da Gama passed along it in 1498 on his way to India, and during the following century they succeeded in firmly establishing their power, and ruled with the aid of tributary Arab sultans. Mombasa was occupied by the Portuguese early in the sixteenth century, and the great Port of Jesus was commenced there in 1592. It was wrested from them by the Arabs in 1698 after a siege of thirty- three months, and has been the scene of much bitter fighting, and has several times changed hands. Until East Africa was partitioned amongst the European Powers towards the end of the last century, most of the coast came under the rule of the Sultan of Zanzibar, and the trade at Mombasa, Zanzibar and Bagamoyo, the principal ports, was controlled mainly by British and Indian merchants. In 1877, Sultan Bargash offered to Sir William Mackinnon, Chairman of the British India Lino (or to a Company to be formed by him), a concession under lease for seventy years of the customs and adminis­tration of the whole of the dominions of Zanzibar, including all rights of sovereignty, with certain reservations in respect of Zanzibar and Pemba Islands. Mackinnon found, however, that he could not obtain the support of the British Foreign Office, and therefore declined the offer. Joseph Thomson, author of Through Masai-land, was the first European to visit the Highlands of Kenya (in 1883). He was followed in 1885 by Hannington, first Anglican Bishop of East Africa. 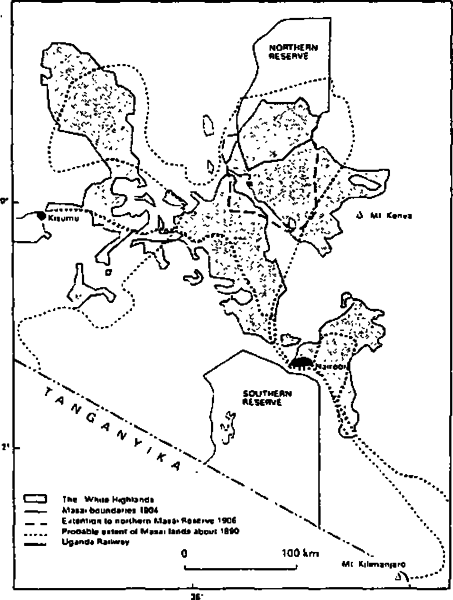 In 1884, Sir H. H. Johnston obtained concessions from chiefs in the Kilimanjaro region, and later in the same year German agents secured concessions in the same area. The British Government raised no objection to the German acquisition, but put forward claims of its own to the hinterland of Mombasa. A provisional agreement between the British and German Governments in 1886 determined the boundaries of the mainland territories of the Sultan of Zanzibar. Other frontier agreements were made with Germany in 1890 and 1893, and with Italy in 1891, fixing the boundaries of their respective spheres of interest. In 1887, Sultan Bargash granted a concession for fifty years to a company formed by Mackinnon, first known as the British East Africa Association, which covered his mainland possessions not falling within the German sphere. This territory, which extends ten miles inland, is now known as the Kenya Protectorate, and the Sultan of Zanzibar receives an annuity for it. In April, 1888, the founders of the British East Africa Association formed themselves into a Company, the Imperial British East Africa Company, with a capital of £240,000. A Royal Charter was granted the following September. While efforts to secure territory in East Africa by German Companies and individuals received the backing of the German Government, the Imperial British East Africa Company carried on unaided its burden of national responsibility up to the end of 1890. The capital was quite inadequate for the scope of its undertakings, and a large part of this had been used up in costs of military operations in Uganda. 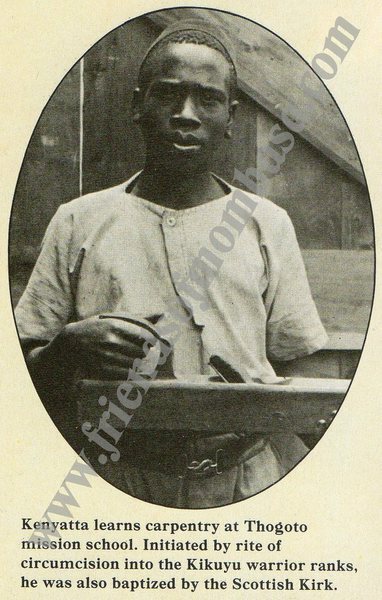 They sustained a further heavy loss when, in 1892, the British Government declared that the dominions of the Sultan of Zanzibar came within the free trade zone under the Congo Basin Treaty. The Company’s dues were thus swept away, but their rent and administrative expenses had still to be paid. Sir William Mackinnon, who had been the Company’s moving spirit throughout, died in June, 1893. In 1895 the British Government finally agreed to purchase the Company’s rights for £250,000. Although the Company proved a commercial failure, involving its shareholders in loss, the promoters were mainly animated by motives of patriotism, and a desire for the abolition of the slave trade and better­ment of the native peoples. From 1 July, 1895, the Foreign Office assumed responsibility for the Company’s territory ; a commissioner was appointed ; and the name was changed to the East African Protectorate. Hitherto the Territory was usually referred to as “ Ibea,” from the initials of the Company. The railway from the coast to Lake Victoria was undertaken by the British Government in 1895 at their own expense. Lord Salisbury’s decision to carry out this work was based on his desire to suppress the slave trade and to provide access to the headwaters of the Nile. It was completed from Mombasa to the Lake in 1901. The length of the line from Mombasa to Kisumu is 577 m. compared with 703 m. by the old caravan route. It ascends to 8,322 ft., and descends again to 3,726 ft., the level of Lake Victoria. A considerable amount of Indian labour had been used in the construction of the railways, and some thousands of Indians remained in the country. The first applications for land were made in 1902, and the following year hundreds of settlers began to arrive. Among them were men of good standing from England, and Lord Delamere, who was one of the first, became the leader of the European immigrants in East Africa. Many of the settlers were Butch and English-speaking South Africans. In 1905, the Territory’s administration was transferred to the Colonial Office. In 1906, in view of the increasing number of European settlers, a nominated Legislative Council was set up on which seats were given to their representatives. King George VI and Queen Elizabeth, as the Duke and Duchess of York, visited Kenya in 1924. In 1914-18, Kenya was the base for operations against German East Africa; in 1940-41 against Somalia and Ethiopia; and in 1942 against Madagascar. After each war there was a considerable influx of British settlers as farmers or technicians, and Indian artisans and tradesmen. The Visit of H.R.H. Princess Elizabeth and Duke of Edinburgh, who were staying at Sagana Lodge, Kenya, was interrupted by the death of H.M. King George VI on 6 Feb. 1952. In 1959 H.M. Queen Elizabeth, the Queen Mother, visited Kenya. 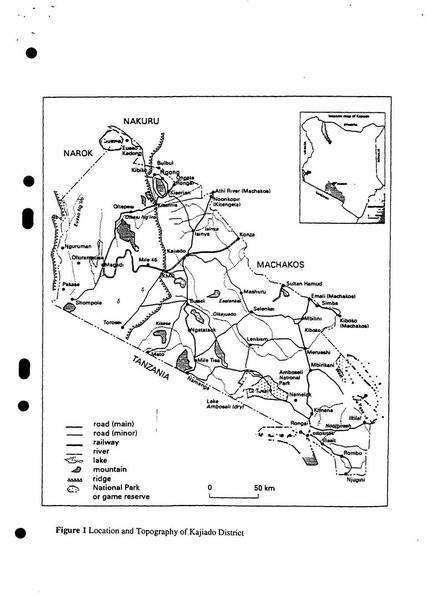 Mau Mau Terrorist Activities:—Though a State of Emergency was declared by the Kenya Government in 1952, as a result of widespread outrages attributable to the Mau Mau organisation and was still in force up to the end of 1959, conditions had in fact improved very considerably, and the State of Emergency was ended. In January, 1960, the Emergency Powers Ordinance was repealed and the Preservation of Public Security Ordinance came into force immediately thereafter. 1 Aug. 1961. Release of Jomo Kenyatta. 1944. Sir P. E. Mitchell, G.C.M.G., M.C. 1952. Sir Evelyn Baring, G.G.M.G., K.C.V.O. 1959. Sir Patrick Renison, K.C.M.G. The Outcome of Subdividing the Maasai Pastoralist Group Ranches in Kajiado District, Kenya. 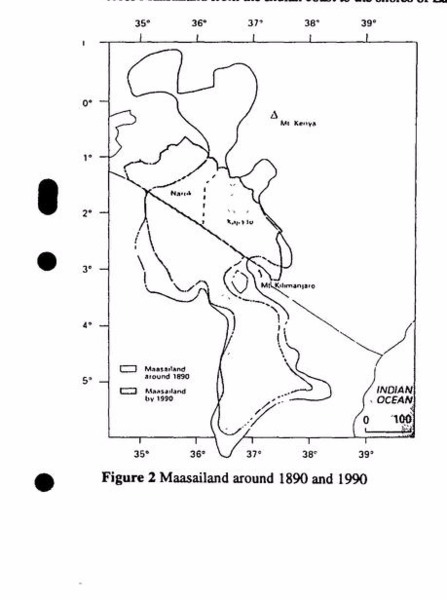 This article is based on research carried out in early 1990 among the Maasai pastoralists of the Kajiado District, Kenya (see figure 1). The survey has foremost been a review of the Maasai pastoralists use and ownership of land from a geographer's perspective, while taking into account ecological, economical, and socio-cultural aspects. The process and consequences of the individualization of land ownership in the Maasai area as it developed over the last century has been studied and special attention has been given to the effects of the subdivision of group ranches started in 1986. 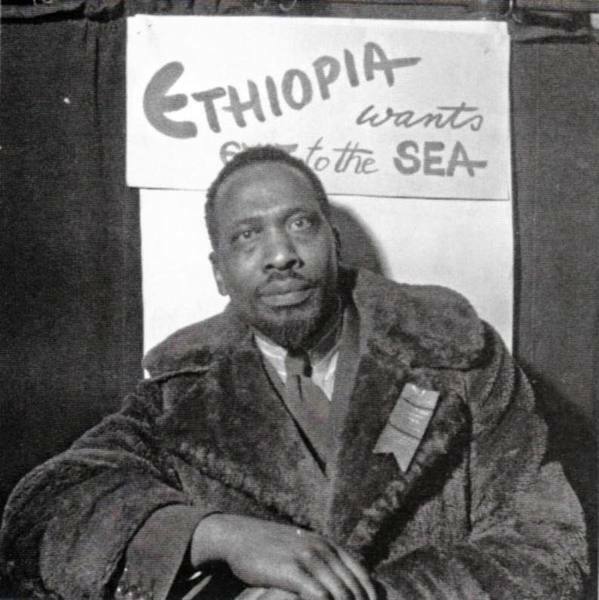 The Colony and Protectorate is bounded on the east by Somalia and the Indian Ocean ; on the north by Ethiopia ; on the north-west by the Sudan ; on the west by the Uganda Protectorate and Lake Victoria ; and on the south by Tanganyika Territory. This territory was formerly known as the British East Africa Protectorate. In July, 1920, the Protectorate, except for the portion under the dominion of the Sultan of Zanzibar, was declared to be a Crown Colony under the title of Kenya Colony. Kenya Protectorate consists of the mainland dominions of the Sultan of Zanzibar, being a strip of land extending ten miles inland along the coast from the Tanganyika border to Kipini, together with the islands of the Lamu Archipelago. In respect of this area, the Sultan receives an annuity of £10,000. Nairobi is the Capital of the Colony and Protectorate and the chief port is Mombasa. The name Kenya is taken from the native name for Mount Kenya, Kilinyaa, meaning the White Mountain. Administration.—The Colony and Protectorate are administered under the Colonial Office by a Governor. Under the Constitution Order in Council of 30th November, 1960, the general terms of which were agreed at the Constitutional Conference of 1960, Legislative Council is composed of a Speaker, appointed by the Governor on the Queen’s instructions received through a Secretary of State, fifty-three Constituency Members elected on a common roll, twelve National Members elected by the Constituency Members, four official Ministers, and a number of Members nominated by the Governor in pursuance of instructions given to him by the Queen through a Secre­tary of State. The General Election took place in Feb., 1961, and the Governor subsequently appointed 12 Nominated Members. Of the fifty-three constituency seats, ten are reserved for Europeans, three for Asian Muslims, five for Asian non-Muslims, and two for Arabs. Of the twelve national seats, four are African, four European, one Asian Muslim, two other Asian and one Arab. A British subject or British protected person over 21 who is literate in any language or is over 40, or has an annual income of £75, or has property valued at £200, or is one of any number of wives of a person with an annual income of £75 or property valued at £200, or holds one of a number of scheduled offices can register as a voter. Over 1,300,000 persons registered as voters for the General Election. General Election.—A general election took place in February, 1961. The Legislature comprises ten seats reserved for Europeans, five for Asians not of the Muslim faith, three for Asians of the Muslim faith and two for Arabs. In addition there are thirty-three open seats and twelve seats for “ national ” members elected by the fifty-three con­stituency members. Candidates for the reserved seats participated in primary elections during January to ascertain if they enjoyed a reasonable degree of support from members of their own race or creed. Successful candidates then contested a further election at which electors of all races were entitled to vote. At the general election in February voting took place in thirty-five of the forty-four constituencies into which the Colony was divided, there being nine unopposed returns. The polling period passed without incident and African candidates were successful in all but one of the open seats, thus achieving a majority in the Legislature. Kenya’s “ Framework ” Constitution.—The Kenya Constitutional Conference in London, Feb./Apr. 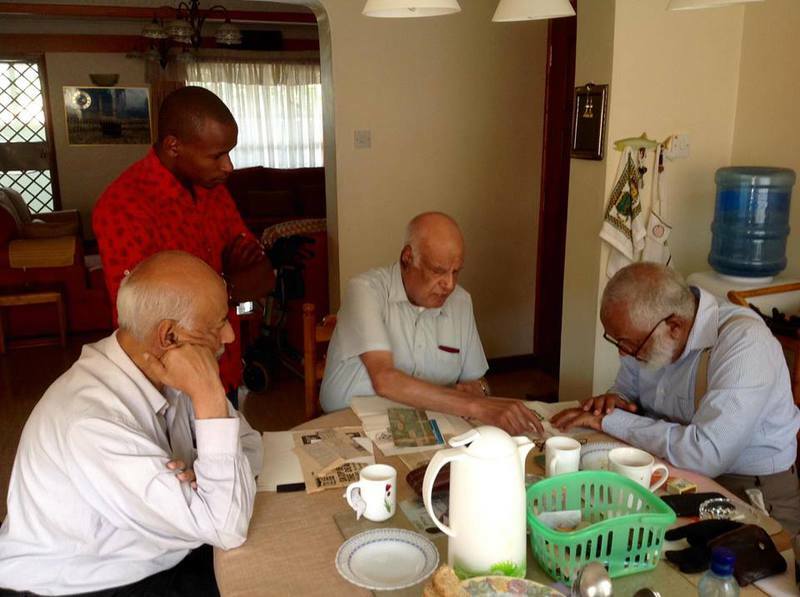 1962, ended with the signing by almost all of the delegates of the Colonial Secretary’s paper setting out a “ framework ” constitution for Kenya. Mr. Maudling’s proposals included provision for an impartial and independent judiciary and a Bill of Rights guaranteeing the proper protection of individuals which should be enforceable in the courts. There would be two chambers in the Parliament. The Lower House would be elected by universal adult suffrage and based on single-member constituencies. The Upper House would consist of one member from each of the existing districts. Consideration should also be given to the inclusion in the Upper House of non-voting members representing special interests. There should be a strong and effective Central Government responsible to the Central Parliament, which would be responsible for a very wide range of activities. Subject to the foregoing, there should be the maximum possible decentralisation of the powers of government to effective authorities capable of a life and significance of their own, entrenched in the constitution and drawing their being and power from the constitution and not from the Central Government. to the regions and entrenched in the constitution. Other administrative powers, including administration of Central Government functions, would be delegated by agreement with the Central Government. In some matters the Regional Assemblies would have exclusive powers of enactment having the force of law. In other matters they would have either concurrent powers or powers of making byelaws. Control of land transactions outside the present scheduled areas should be vested in the appropriate tribal authorities. The constitution would also establish a Central Land Board with sole responsibility for the formulation and implementation of settlement schemes in the settled areas. The Central Government would be responsible for the Armed Forces and the ultimate sanction of law and order, but the day to day responsi­bility for law and order within each region would rest with the National Assembly. Formation of Coalition Government.—Details of the constitution based on this framework will be settled by the Kenya Coalition Government in discussion with H.M. Government. The Coalition Government has been formed also to increase national confidence and unity and to continue good government. The formation of the Coalition Government, which will be led by the Governor, has been completed in Nairobi by the Acting Governor of Kenya, Mr. E. N. Griffith-Jones. The size of the Council of Ministers has been increased to 16. The Governor has agreed with the leaders of the two African political parties that the two official Ministers now responsible for the portfolios of Legal Affairs and Defence, Mr. A. M. F. Webb and Sir Anthony Swann, should retain these portfolios. It has also been agreed that Mr. Ronald G. Ngala (KADU) and Mr. Jomo Kenyatta (KANU) will be respectively Minister of State with responsi­bility for Constitutional Affairs (in liaison with the Governor’s Office) and for the Administration; and Minister of State with responsibility for Constitutional Affairs (in liaison with the Governor’s Office) and for Economic Planning. As soon as possible after these details had been settled and the neces­sary instruments for an internal self-government constitution had been made, a general election would be held and that constitution would be introduced. 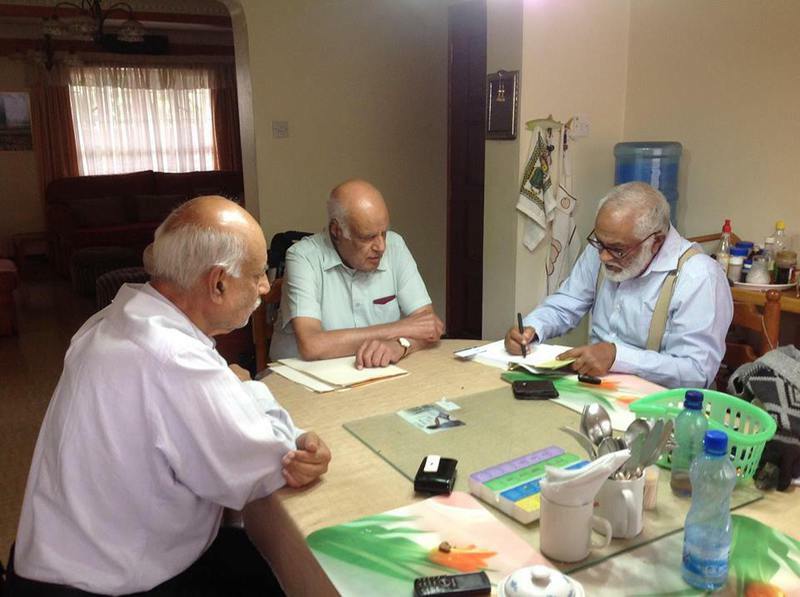 Certain steps, such as registration of voters and delimitation of the Regional boundaries, could and would be taken before these details were finally settled. Thereafter further negotiations would be needed on arrangements for full independence, which Her Majesty’s Government reaffirm to be their aim for Kenya. A council of State was formed in 1958, with powers of delay and revision to protect any one community against discriminatory legislation harmful to its interests. It has been continued under the new Constitu­tion. It consists of a Chairman, and ten members nominated by the Governor and drawn from all races in Kenya. Four hold office for 10 years, three for 7 years, and three for 4 years. A considerable measure of local self-government is exercised by the African District Councils, of which there are 33. There are Municipalities K.A.N.U. = Kenya African National Union. Here is the person who designed the Kenyan National flag, the coat of arms, and the Presidential standard just before Kenya was granted internal rule on 1st June, 1963. His late mother worked late into the night to work and complete making the 12 flags that were to be flown on the 12 ministerial cars. 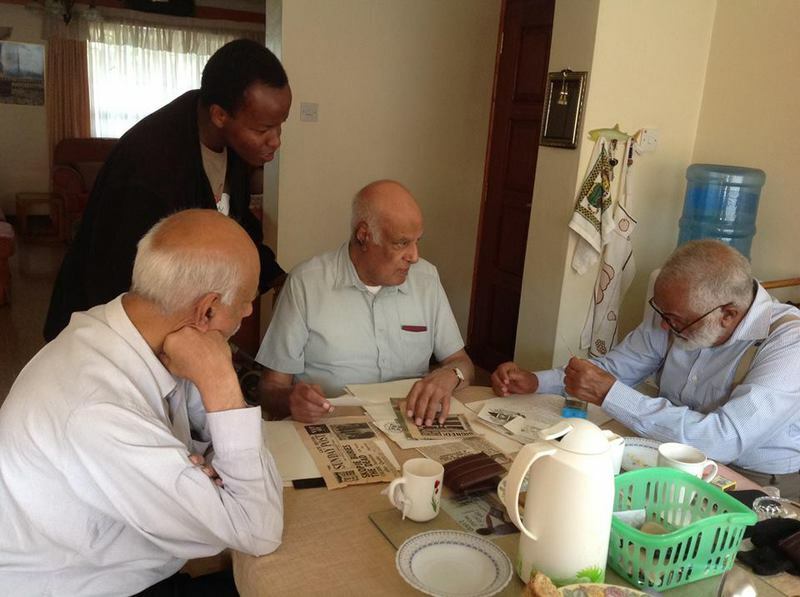 M.A.Sheikh,MA,ARB Chartered Architect & Urban Designer who migrated to the UK in 1973,is now practicing in London, was a civil Servant in Kenya and worked closely with Joseph Murumbi and Robert Ouko when he was assigned the task of designing the various flags, including designs for a number of medals. More photos and old newspapers cuttings will be posted later. Some more photos of the art work undertaken by M.A.Sheikh. Most were finally approved after the desired changes were incorporated. The drawings of Lions in the original design were not accepted and the sketches of real African lions were incorporated. Since cockerel was KANU's symbol, KADU supporters used the Panga (Matchet) as their symbol and were their weapon for slaughtering the Jogoo! Sheikh used his own creativity and replaced it with an axe which was well received and incorporated in the final design. The Right Rev. 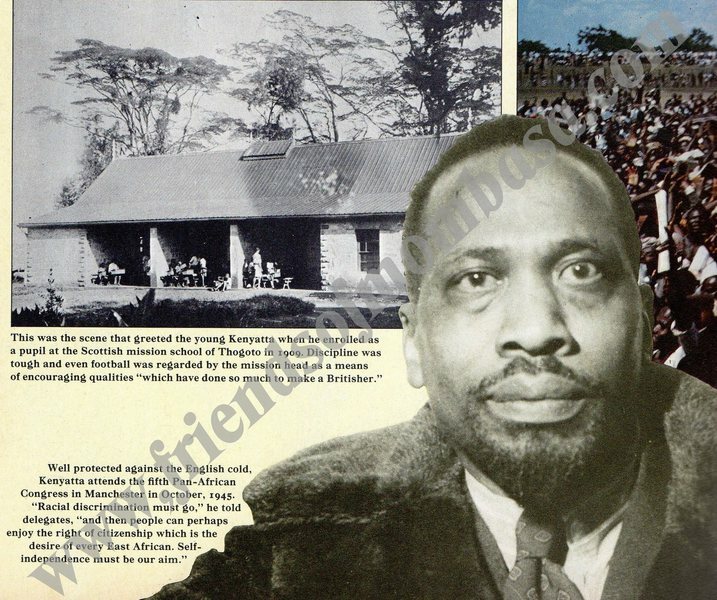 Thomas Johnson Kuto Kalume is the composer and co-producer of “Ee Mungu Nguvu Yetu“, the Kenyan national anthem, which was recorded in September 1963 and inaugurated at Uhuru Gardens on December 12, 1963 during Kenya’s independence celebrations.